Established in 1980, we are a wedding and feather supplies importer and wholesaler who specializes in Bridal Headpieces, Bomboniere Flowers, Gloves, Parasols, Lace, Fans, Boas, Marabous, Feather Pipings, Masks, Angel Wings, Natural Feathers & Dyed Feathers, etc. 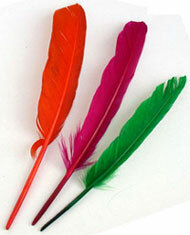 Our unique selection of over 4,000 wedding and feather supplies makes every wedding a memorable one. Visit our 1,500 square-feet show room in person and take advantage of our daily show room specials or visit our virtual show room now! 9:30 AM to 4:30 PM Monday to Friday (By an appointment only). Please call or email your time before you come. Thank you. Thank you for visiting our website. Please note that we sell wholesale to Trades only. You must be in business in order to purchase our products or to obtain a copy of our price list. If you are in business and are interested in our products, please fax or e-mail us your business trades information. If you require a copy of price list or any items' price quote, please register click here and submit with your business information. Thank you.